« What Happens to a Dream? 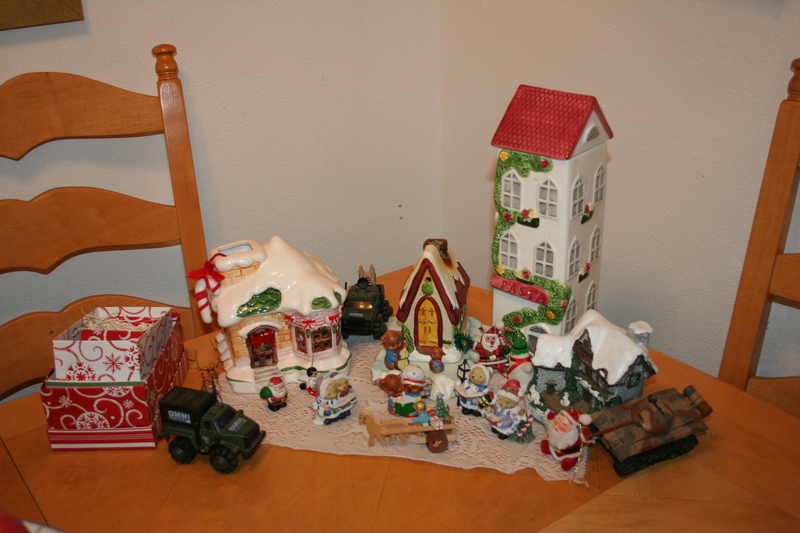 I had my little Christmas village all set up before the tank and armored vehicles pulled in. there has been no violence and the citizens of the little village have carried on as usual with caroling and building of snowmen. Santa doesn’t seem to be ruffled about having that tank parked behind him. If I told you how this happened, you wouldn’t believe me. After Don “fixed” the little battery-operated toys in Zephan’s toy box here at the house (the ones Zephan’s mother declared would stay at Poppa’s house) and after the boys left (thankfully), Don mused that it would be fun to fix the battery operated military vehicles that have been gathering dust for 25 years or so. So I brought them downstairs. And that was as far as they got: downstairs, kitchen table. One morning we got up and they were parked in the village. I guess the soldiers are in the pub having a drink or in the church praying. I don’t mind. It just reminds me of my absolute very favorite Christmas song ever.